Friday, Friday, gotta get down on Friday…I got down on Friday trying to find a stream for this game. Unfortunately, all of the links supposedly for this game led to tennis, volleyball (indoor AND beach), or soccer. Fortunately, I was able to find the game later on. My efforts to get my hands on Ukraine’s friendly games were unsuccessful, and so this is the first game in months that I’ve had any interest in. Empty arena; coaches were in t-shirts and jeans; the bench was a row of lawn chairs. Even so, it was blissful to have basketball to watch. If you learn something new about yourself everyday, what I learned about myself is that I can get overly excited about a friendly, inconsequential game between European teams. 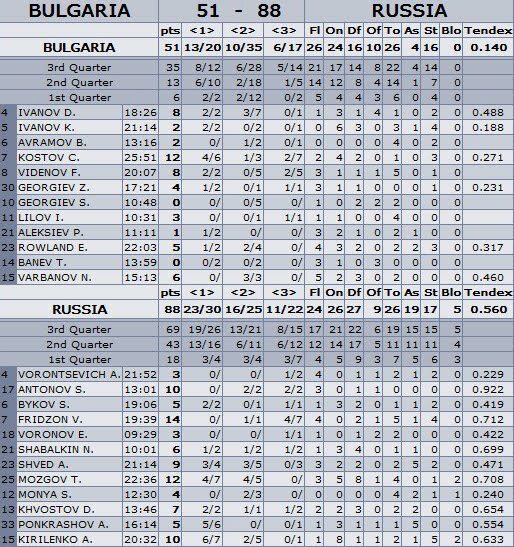 If I am reading the box score correctly, Andrei Kirilenko (starting PF) played 20:32 in this blowout (Timofey Mozgov (starting C) played the most minutes for Russia with 22:36) and had 10 points, 5 steals, 2 blocks, and most notably drew 8 of the 26 fouls awarded to Russia. Aside #1: I hadn’t seen much of Mozgov before, but man…that dude is one massive human being. He’s about the same height as Fes but Fes outweighs him by 30 lbs., so I can’t explain why he looks so huge. He just does. Aside #2: In the third game of the day, the Koof scored 7 points and had 2 rebounds, 1 block, 4 TOs and drew 4 fouls in Greece’s 76-70 win over Italy. Italy was led by Marco Bellinelli’s 21 points and Andrea Bargnani’s 14. Wonder what happened to Gallinari, though I’m not curious enough to Google. AK scored the first bucket of the game and 4 of Russia’s first 9 as Russia got off to a 9-0 run. It was 35-9 with two minutes to halftime and 43-13 at the half. Bulgaria made a FT with 8 seconds left in the game to break the half-century mark and make it [a more respectable] 88-50. Final score: 88-51. The highlights aren’t much; it was that kind of game. Probably 25% of it is AK shooting FTs and another 20% is just shots of AK’s back (haven’t seen the jersey/tattoo combo ’til now, and I’m kinda fascinated by the sight). If you’re as starved as me for basketball, though, this might have some value. 1. When he’s wearing a jersey, AK’s tattoo doesn’t look nearly as horrid as I expected. It’s actually an interesting, subtle thing—almost like adding a bit of cinnamon to chili. 2. How the hell do they know where to stand when taking free throws? There’s no line! I couldn’t stop obsessing about that while watching the video. 1. The part that shows is actually quite subtle–kind of like he’s wearing one of those mesh tattoo sleeves or something.